pictured to the left is my mother, marlyna, posing with me in october of 1978. i was five months old. 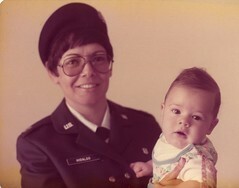 she was just entering the united states air force for what would turn out to be 25 years of service. last year, when she retired as a lieutenant colonel from the united states air force reserves, she out ranked my father. my mother has always been a true patriot. when i last visited my parents, my loving mother showered me with gifts. from powerbars, books on leadership, to a small guide book from the library of congress, her love was tireless. contained within this little book is a simple guide for interviewing veterans for the veterans history project. packed within it's pages are documentarian's dream. paid by the american tax dollar, you can easily cut and paste their simple guidelines, sample releases, audio and video recording log, photo log, and manuscript data sheet into any project you would like. check out their website for PDF versions. also, if you know of any pearl harbor survivors, you should also check out the pearl harbor survivors project. while i may not always agree with american foreign policy, i will never forget that the men and women that serve our country are no different that any family i see walking down the street or having a bqq. as i once prayed that my parents would return home soon, i pray that our warriors can return to their families safe and sound. Locations: video is shot in Beavercreek, Ohio; photos are from around the world. About: at the end of may, i ventured to the midwest to attend on old friend's wedding. on the way back to new york city, i stopped by my parent's home in beavercreek. for three days, we chatted, told stories, and reviewed old photographs. in the evening of the last day, i asked my parents to sit down for a interview. this segment contains seven minutes of an hour long interview. the photos that bookend this segment were rescued from my paternal grandfather's house. starting with rare photograps of my great-grandmother, the intro primarily contains images from my father's side of the family. the ending photo montage contains photos of me primarily shot from my father.